i was pretty darn impressed by the design school booths. mainly pratt (duh), clemson and the royal danish academy. students almost always think of something original and creative using materials that others aren't. first place first- pratt. pratt's samira gagne (with an accent on the 'e') made some gorgeous pieces (see above) that i was dying to ask her about, but just didn't get the chance to. 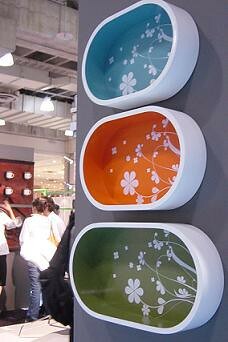 she made really stunning flower bowls and porcelain plates/holder systems that i wanted to buy on the spot (i can't imagine they won't be in stores soon). 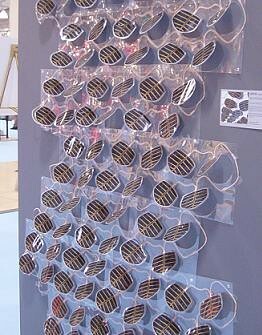 they were lovely, simple and extremely practical (not always a design school trait). her fellow prat comrade, samuel cabot cochran made a gorgeous "grow" system which was a modular solar panel system that attaches to the side of any building. it looks like plastic leaves and i wanted to put it all over my kitchen. it just looked so fun and jungle like. the system is comprised of dye cut solor panels, flat copper connectors and piezo-electric crystals, which utilize the system's wind movements to ensure that all the system's elements produce or move energy. too, too cool. contact me if you'd like info on samuel- i don't want to post his email address for fear he'll get that weird german spam that's going around. same for samira. the adorable girls from the royal danish academy (see above) did some more experimentation with industrial felt (last year's design school material of choice). 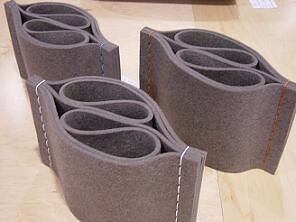 their booth was the result of an experiment in which each student was given 2 sq meters of felt to work with. 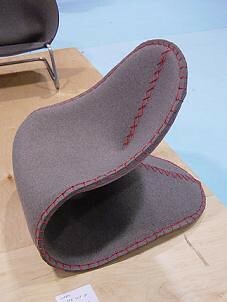 the end product was a great sample of felt seating (see pics). clemson (yay south!) 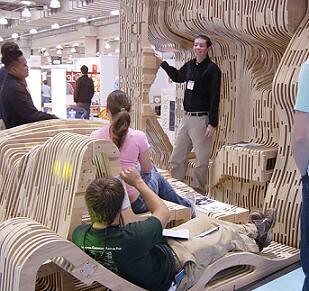 put in a great showing too with their panton living tower-like structure made of cut, multi-level wood (see top pic). it was like a big playground of design students lounging on wooden seating. pretty cool. most of these kids don't have websites, but let me know if you know otherwise. i just wanted to share their work because their creativity was inspiring and a wonderful change of pace at the show. pssst. Harvard Graduate School of Design was representing too, but we were working under the aegis of another booth-- the Swedish Trade Council. pssst. Just because Harvard GSD was there doesn't mean they had the finest work. It's nice to see other less established schools in the spot light. Remain calm you won't lose your Ivy over it. snappp. who said anything about finest? play nice or you wont get any dessert.